In the past I’ve discussed many of Rome’s great engineering feats -- Aqua Marcia, Caesar’s bridge over the Rhine, and the siege works at Masada, to name a few. The Romans were the greatest engineers of antiquity because structure and organization were fundamental to their view of the world. For this post, we turn to Hadrian’s Wall, that enigmatic barrier built across Northern Britain in the early 120s A.D. 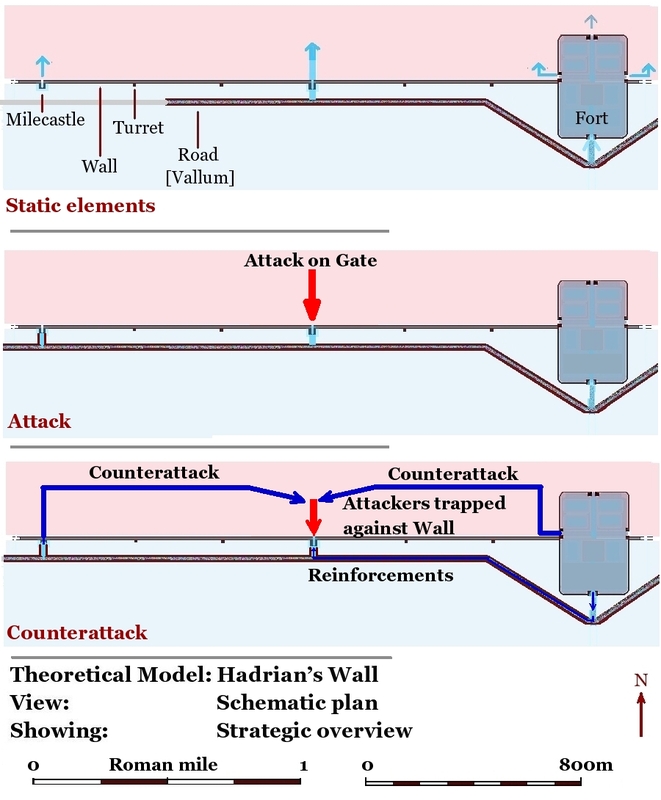 There are many holes in the story of the wall including the purpose of its construction -- but its existence can't be disputed as you can see from the photographs below. The wall was constructed at the direction of emperor Hadrian, according to restored sandstone tablets in found in Jarrow England, to “keep intact the empire” which had been imposed on him by “divine instruction”. Hadrian traveled to Great Britain in 122 A.D. and may have visited the wall during the initial period of construction. The wall took seven years to build and it was completed in 128 A.D. Spanning a 73 mile distance from east of Newcastle through Carlisle and on to the coastline of the Stolway Firth, the wall is stone from the River Irthing east and earthen from the river west. The difference in construction materials reflects the availability of stone in the east and the lack of same in the other direction. The map above shows the geographic position of the wall and my yellow line approximates the point where the stone wall ended and the earthen wall began. The wall in the east was a stone structure constructed using concrete as the strengthening material. It was about eight feet wide and extended to a height of twelve to sixteen feet. The walkway along the top was four to five feet wide. West of the Irthing, where the wall was earthen, the structures were wood or stone. A defensive ditch was located twenty-two feet north of the wall. V-shaped with the bottom squared out into a channel, its dimensions were thirty-five feet wide and ten feet deep. The ditch was omitted where the wall ran along precipitous rocks. There were seventeen forts along the wall averaging about five miles between them. Seven were built astride the wall and six were attached to its southern side. The forts were of two sizes: two and a half acres, the size required to accommodate 500 men and 5 acres, the size required to accommodate 1000 men. At regular intervals, approximating a mile, the Romans constructed milecastles with dimensions of about 70 x 60 feet and attached them to the wall. They were of a size to accommodate 100 men and had gates to the north and south. Turrets were located between each milecastle at 1/3 and 2/3 of the distance between them. Each turret was about thirteen feet square internally and contained a staircase used to climb to the rampart on the top of the wall. There were no stairways on the wall except at forts, milecastles, and turrets. 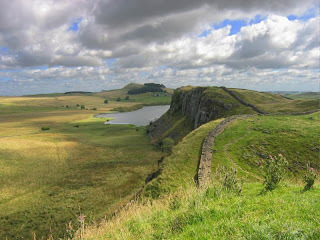 A road ran behind the wall, passed through the east and west gates of the forts and also branched off to a road leading to the milecastles and a path to the turrets. At varying points behind the wall sat a defined earthwork barrier called the Vallum. A ditch was dug thirty feet deep and seven feet wide at the flattened bottom. The contents of the ditch were used to create a mound on either side of it about six feet high and twenty feet across. The ditch and mounds were separated by berms of about twenty-four feet in width. The entire barrier of mound, berm, ditch, berm, and mound was about one hundred and twenty feet across. Lastly, behind the Vallum sat a Roman road called the Standgate. The wall was first mentioned by Dio writing in 230 A.D. He said “The tribes of the island crossed the wall which divides them and the Roman stations and were doing much damage…” Later he says, “the Maeatae live close to the Wall which bisects the island, and the Caledonians beyond them”. 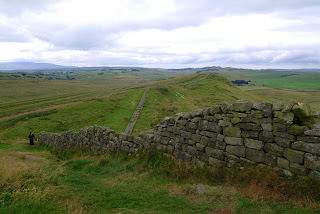 Towards the end of the same century, Aelius Spartianus, one of the writers of the Historia Augusta, said of Hadrian: “he visited Britain and put many things straight there: he also was the first to build a Wall, eighty miles long, to divide the barbarians from the Romans”. 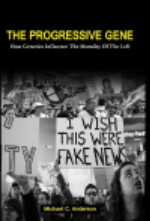 The purpose of the wall has been endlessly debated, which seems surprising. One would think it obvious that the goal was to keep the northern tribes from attacking territory controlled by the Empire, but there are those that have argued that the tribes didn’t pose enough of a threat to justify the enormous expense of building the structure. 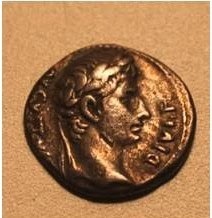 The true answer may be as simple as Hadrian employing his "defense before expansion" strategy or perhaps he simply decided to draw a line where the Empire in Britain would end. Still, it is clear that the wall was built as a defensive structure. 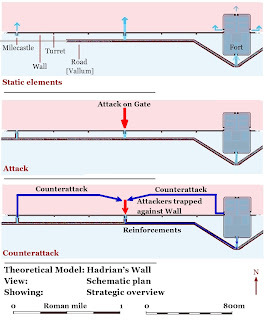 Examine the following graphic, provided to me by Geoff Carter, which demonstrates how the wall was designed to facilitate a counterattack against invaders. Michael! I don't know how to contact you, other than leaving a comment. I'd be honored if you took a look at my most recent work of historical fiction, on the biblical Samson. Its published free, on Wattpad. The link is below! Alexander the Great – What if he had lived?